Strand Natural Fibres Limited is a home based company that manufactures, and sell a range of embroidery patterns, and materials, particularly complete kits. They have sold through craft shops, and also by direct marketing. The client wished to expand the business by creating an online catalogue of a limited number of products. 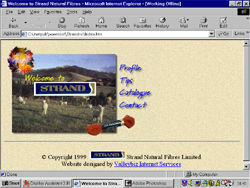 We built a site in Macromedia Dreamweaver Ultradev and linked it to a Storefront™ cart using ASP. While many of the non product pages are static in content, all information on the products, and categories is fed from a database which the client can update via an online form. The client can also add items into a FAQ section, and Helpfull hints section from webforms. "We are delighted with the web site Valleybiz have done for us. It sets out all our products clearly and is very easy to use (so our customers tell us). Paul explained everything to us very simply when we went to him for advice at the beginning (we were complete novices!) and now that it is up and running he has shown us how to upgrade our site ourselves and remains willing to advise us if we need help. We recommend him unreservedly His services are very reasonably priced and are in our opinion real value for money."